More detail and photos below for those interested. Arrived Friday afternoon and went straight to Harelbeke to catch the finish of E3. 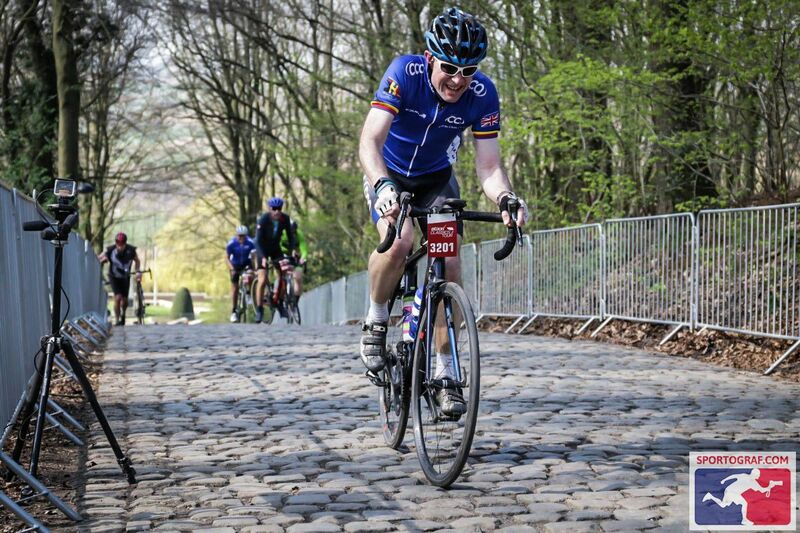 Really easy parking close to the finish and walking along the course to the finish straight, which was very busy but well supplied with frite vans, beer vans and the Kwaremont beer bus. Very easy to watch the final sprint and get close to the riders afterwards. Then off to Wevelgem 15 mins away to register for tomorrow. Registration very easy, took 15 mins. Then to the hotel, stayed in Diksmuide in the usual CCA hotel familiar to those who have been on the Belgium trip. Excellent as ever and we were well looked after as pretty much the only guests. Early start Saturday - but having registered no hassle at all. Free coffee in the start village and a lot of excitement as all the riders tackling the full course gathered. there are 4 distances for the sportive: 60, 90, 140 or 215 km. We of course chose 215 km... All those doing the long course were encourage to start early between 7 and 8 a.m. So off and immediately onto fantastic country roads through beautiful rural countryside. roads were narrow and quite technical with some sharp turns but great tarmac and no traffic. this is an open road event but virtually every junction had marshals who stopped the traffic. The locals love cycling so all motorists seemed to happily obey. the weather was excellent which helped, cold start but by now upto 19 deg and light winds. however as we turned south up near Veurne, we entered the De Moeren area famous for cross winds. this was tougher with some messy echelons forming, and would have been really tough on a normal day with high winds. speeds dropped a bit here and again when we entered France and hit the climbs familiar to CCA Belgium riders. These arent long but after 90 miles they hurt. They found some new climbs too and took us on some great roads. plenty of scope to add these to any future CCA trip. after winding in and out of France we came back into Belgium and hit the Kemelberg, going up the steep cobbled side that we sometimes ride down in the September trip. very rough cobbles and very steep but quite short. From here it was a mere 30 miles or so back to the finish... via the descent of the K'berg, some flat roads, the tiring Plugstreets and then a long fast run in along the river. The adrenaline kicked in here and we found a wheel to follow and emptied the legs for a long sprint home. Ride complete 213 km / 133 miles at 17.5 mph in the end. collected the t shirt and got beer and frites in the village and enjoyed the amazing sunshine and the satisfying pain in the legs - this was a great ride but it did hurt! anyway back to the beer and frites.. road gingerly down the K/berg dodging drunk locals, coaches and policemen. the little town of Kemmel at the bottem was party town. barbecues, live music, djs playing cheesy euro-pop and some very lively bars. a very old tired looking bus parked at the bottom of the street turned out to be the Peter Sagan fan club so we chatted to some of them.. although its quite hard understanding a very drunk Slovakian... Anyway Kemmel was a lot of fun. Cycled back home accompanied by a bloke on a mountain bike wearing brown leather shoes heading for a party in Ypres. Tried upping the pace but he was up to the challenge. Said goodbye and headed back down the canal finishing with an ill advised traditional sprint into Diksmuide which allowed the legs to remind us that we had done enough of that sort of stuff yesterday. In Diksmuide Skelders bar was packed for Flemish pub quiz night. Very posh, all done on tv screens and with mobile phones. then a game of pool and the honesty bar in the hotel. a great way to end the trip. home Monday morning, back by lunchtime. this was a great trip, the weather definitely helped, but would thoroughly recommend this, or any of the spring classics in the region, they are very easy to go and watch and i think they all have associated amateur rides you can do. Awesome Stef, great report and well done mate! Sounds like just the perfect cycling weekend. We need to get the club back to Belgium soon. Thanks for sharing Stef. Great write up Stef, well done on completing such an epic ride. 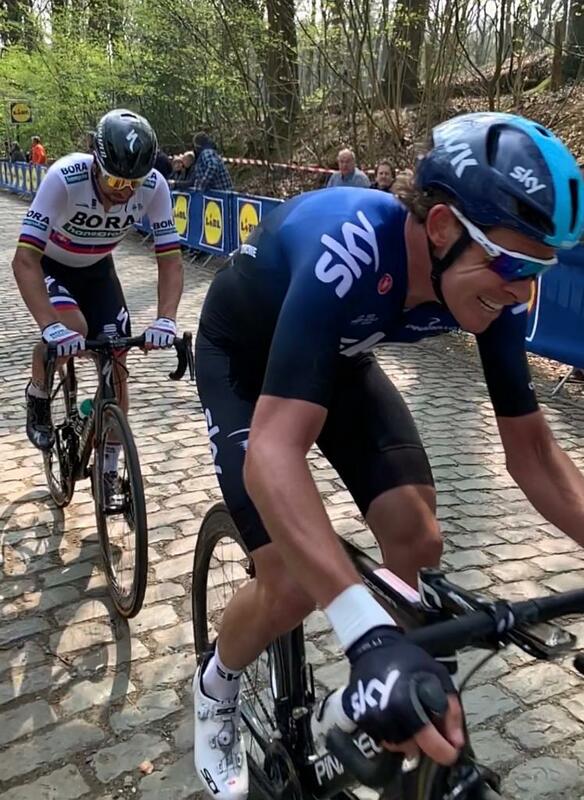 Super pictures...especially like the way the picture of you on the cobbles follows on from Rowe and Sagan....did you catch them? ?